i don’t just like totally target on facebook, i LOVE them. Love your site. Would love to win! Thanks!! Love the opportunities you put on. Would love to win – thanks for offering! hope you are having a great st pattys day…. I wanna win a target gift card! 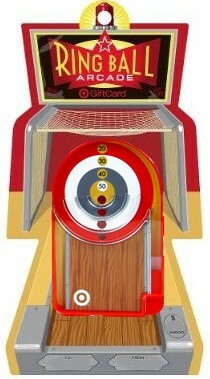 Love Pinball, Love Gift Cards, Love Target! Perfect! Love the chance to win.. Thank u! Love you guys & would love to win! I would SOOOOOOO LOVE to win this! Thanks! As always, your giveaways are great and you’ve got the most unique giftcards I have ever seen. I “like” Totally Target on Facebook, but it is all a rouse because I seriously love your site! Love the skeeball game gift card! so cute, hope to win! thankyou! Already like it on FB!! Thank you! Hope I win some day!!! THANKS! 🙂 Have a great weekend! Let this be my LUCKY day! !